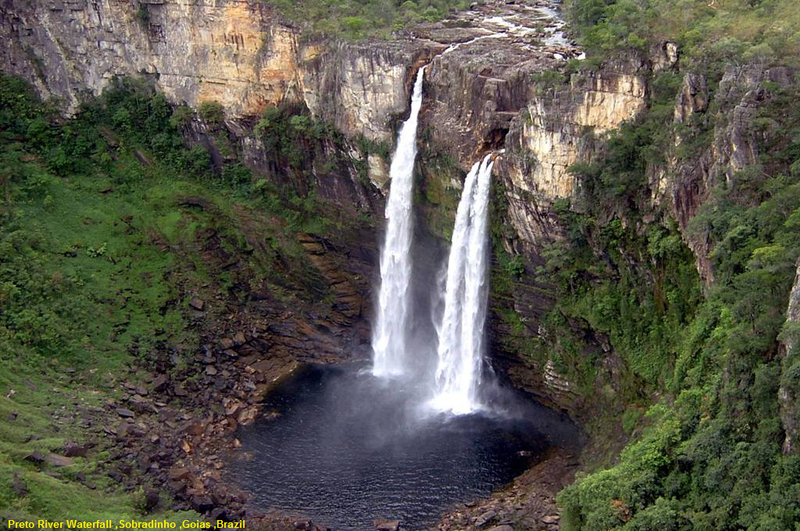 Salto do Rio Preto is 120 meters approx., one of the attractions of the Chapada dos Veadeiros National Park, in Goiás, one has to take a walk, as the trail to reach the waterfall is 5 kilometers long. While there, enjoy the opportunity to be acquainted with Cachoeira do Garimpão (80 meters), another waterfall located exactly on the same trail, with several wells where visitors can take a bath. It´s located 230 km north of Brazil, you can leave by car going to satelite city Sobradinho and turn left after Planaltina. There are lots of road signs. The city itself is very small and easy, a Main Avenue (Avenida Ary Valadão Filho) starts on the road and cuts through the whole of it. The Bus Station is two blocks to the right of Main Avenue and all the "buy", "eat", "drink", "stay safe" and half "sleep" options are either at Main Avenue, (at most) two blocks away of it, or close to Bus Station. It´s that simple. There are a lot of waterfall options around Alto Paraiso (Loquinhas are the closest and coziest, Crystal River is close too, there is a hiking trail to Sertão Zen, a little harder, Couros and Macaco rivers require a 4WD vehicle), but the best ones are around Vila São Jorge (St. George Village) 36 km west, the gateway to the National Park. There are vans and little difficulty to hitchhike. The road is very scenic, half of it is paved already, but the dirt part can get a little annoying during the rainy season (October-April).